Where is the Best Place to Visit in India? Looking for where is the best place to visit in India? 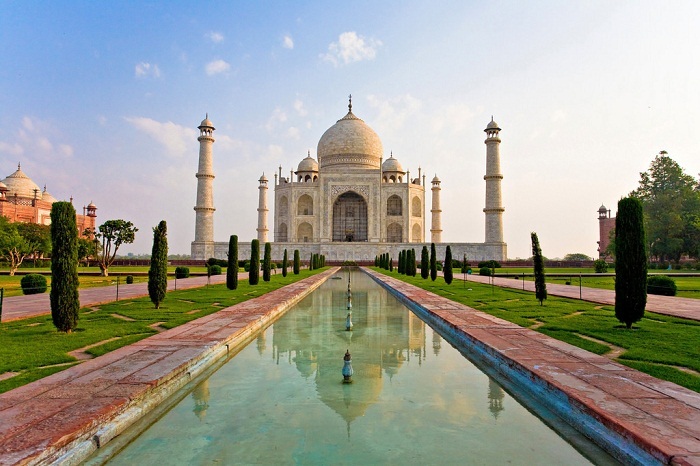 That is a little difficult but check out these Top 5 Places to visit in India. India is a sub-continent peninsula with various cultures. There are so many enthralling places to visit here. Apart from the rich culture and heritage there are several other reasons to visit this place. The pleasant weather, warm–hearted people, traditional beliefs, colorful festivals, widespread cuisine, etc. We have pulled up five best and most sought after places that guarantee a fully satisfied holiday trip in India. Your holiday will certainly come to an exciting end. But you will take the excitement with you to get recharged. So get all geared up for your next sightseeing visit to one of these exotic locations with your family. It is the capital city of India and one of the main destinations to visit. This city has everything to explore from historical sites to lip smacking delicacies. While roaming in this city you can visit the India Gate, Humayun Tomb, Rashtrapati Bhawan, Rajghat, Qutub Minar, Red Fort, Jantar Mantar, Lodhi Garden, Agrasen ki Baoli etc. You can find a variety of foods in Delhi. If you are a foodie then you must visit Paranthe Wali Gali, Chandani Chowk, Salim’s Kabab – Defence Colony, Delhi Chaat, Khaan Chacha and more. You can have the treasure of Delhi if you love shopping. Dilli Haat, Janpath, Chandni Chowk, Lajpat Nagar, Sarojini Nagar, Khan Market and Shankar Market are the top famous markets of Delhi where you can get handicrafts, antique collections, jewellery, clothing and much more. One of the locations for several domestic and international love birds, this romantic destination dedicated to love is sure to boost your romance. This was built by Shah Jahan in memory of his dearest beloved wife, Mumtaz Mahal way back in the 16th century. This is a massive tomb is worth all your time and do not forget to visit the Taj Gardens. There is a main walkway connecting other 5 identical walkways which are unique in their context. There is an elevated marble Chabutra Platform. There are five amazing fountains springing out from the ornamental pool here. No wonder this pure white marble structure is listed as one of the Seven Wonders of the World. This is one of the oldest historical sites in India. This stands high at the level of 410 feet over the city. This was where the prestigious Royal family of Jodhpur lived. Most of the structure is sculpted from the rock itself. You must be a healthy person if you wish to walk up to the Jai Pol which is the Northeast entrance gate. It is a walk of around 300 km or you can opt for an auto rickshaw for 200 Rupiahs Indian currency. Get a spectacular view of the antique artillery from the panoramic ramparts. View the scars of cannon -balls on some of the walls. There are hand prints of those who committed jawhar still visible as some have been re-imprinted. These are hand prints of the royal wives. There is a ticket fee for visiting the museum though entrance is free. Not only Mehrangarh, there are various forts and monuments in Rajasthan to explore. Jaipur, Udaipur, Jodhpur, Bundi, Mount Abu, Jaisalmer are the main cities in Rajasthan that attracts the visitors. If you are wildlife lover then Rajasthan is very good for you as here you can spot the tigers along with varieties of flora and fauna in Ranthambore National Park. This is one of the busiest places in India. You can hear the hustle and bustle when you go out for an evening stroll. Known as the hub of business and entertainment industry you can also view the ancient monuments and take a ride in a Tonga. This city is also known as the New York City in India. It has a lot of variety for sightseeing. The most sought after entertainment industry for the entire country or Bollywood is situated here. Go for a splash at the beach waters on the shores of the Arabian Sea. Here you can also take a camel or horse ride. Satisfy your gut with the spicy and tangy street food available in plenty. Ride in the Tangos that are decorated horse–driven carriages for a fun ride along the road. Pass through the prestigious and historical Gateway of India. Mumbai city is also the best place if you are looking for economical shopping. This is one of the most ancient museum libraries. If you want to get away from the technology obsessed busy life we all live in today, this may be a walk down art and literacy. Located on Queensway, Kolkata this ancient museum dates back to the Queen Victoria times. There are ancient western paintings, rare historical pictures, and British architecture. The structure is built in an Indo -Saracenic revivalist way. There are lush gardens with colorful flora and 25 total galleries to explore. These include the Center Hall, Portrait Hall, Sculpture Gallery, Armor Gallery and the latest Calcutta Gallery addition. This wonder of architecture should definitely be your full –day visit on your itinerary. Apart from this Howrah Bridge, Jorasanko Thakurbari, Fort William, Belur Math, Mother House, Kali Mata Temple, Park Street, Jaldapara Wildlife Sanctuary, Birla Temple, Eden Gardens and Marble Palace Mansion are the top attractions here. These are the top 5 main destinations to visit in India that no one should ever miss.